Based on legendary MESA BOOGIE amplifiers, this amp simulation plug-in includes 6 Control knobs, Speaker Emulation with Bypass, Stereo Mode Switch and Boost Switch. 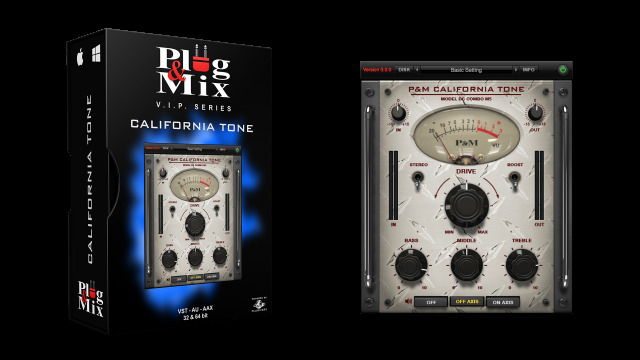 The P&M California Tone guitar amp plug-in delivers true tube dynamic and feel from warm boost to screaming tube saturation. The P&M California Tone offers a wide range of tonal colors from clean level boost to seething saturation. The California Tone is designed to blend beautifully in your music and add richness and gain to your guitar tone. Add to this no compromise speaker emulated output and you have the ultimate Overdrive California dream. The P&M California Tone can be used as a simple guitar preamp or take advantage of the built-in speaker emulation for a full guitar amp simulation.